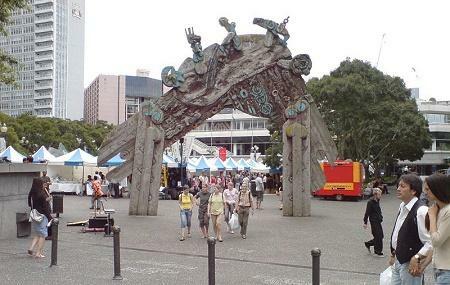 Aotea Square is public plaza with sculptures and statues lining its perimeter. Spread across 4,500 square metres, the Aotea Square is the largest open-air space in Auckland and is used for many different activities including festivals, parades, political rallies, cultural shows and community events. The Square is the centre of the entertainment precinct of Auckland with venues ASB Theatre, Herald Theatre, Town Hall Concert Chamber, Q Theatre, and Basement Theatre in the immediate vicinity. The square is handily located to public transport links and also a bevy of great restaurants and bars for pre-theatre menus and dessert nearby. Bus stop outside St James Queen Street. How popular is Aotea Square? People normally club together Auckland Harbour Bridge and Saint Patrick's Cathedral while planning their visit to Aotea Square. I used to think Aotea Square was a bit of an eyesore, but over the years it has been vastly improved to become a useful and flexible showplace for holding community events and as a general meeting-place. The facilities (shops, food court, cinemas) within the main building are good, and if you need something they don't provide, then the nearby Queen Street shops should be able to provide. A nice square to chill. Plenty of places to sit. The last time I visited, there was a tent? being constructed for a series of shows. And there's a giant screen near the grass area playing short clips. Sometimes, there are skateboarders who use a particular area next to the grass patch to their leisure - never had any trouble. Every time I visit Aotea Square it's for an event and I can't think of a time I've been disappointed. From burlesque circus to comedy to ice skating. Ultimately it's just a venue, but it's always clean, well maintained and worth the visit. Fantastic public place with a lot of cultural and community events. Also great to have your lunch outdoors. Constant meeting point with friends. The square has a nice inner-city bustle vibe. Often there are performers or activities. It's not really a spot to have a picnic though. Albert park is much better for that.